I'm behind!!! Horribly behind with my blog!!! So much has happened since my beach trip! 2 dolls found new homes. 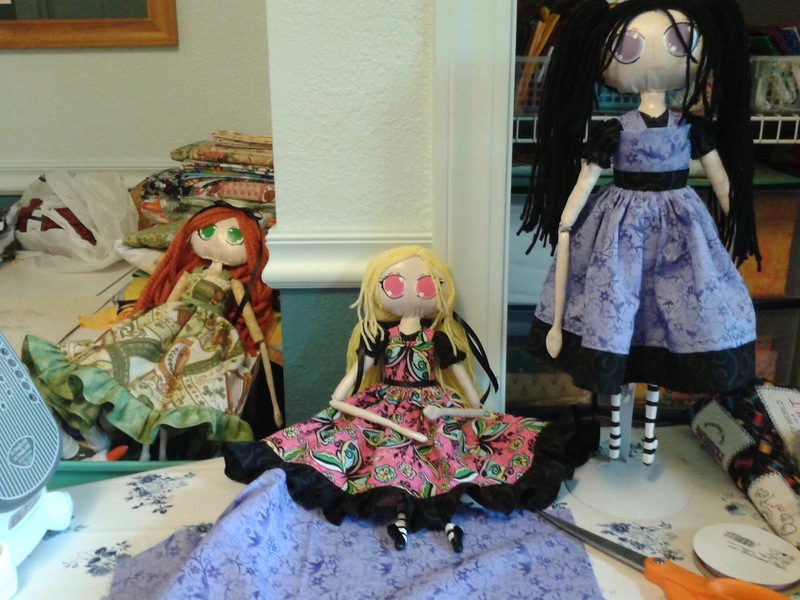 Miss Shy Violet is now on a cross country trek to join her sister Almost Alice! I have a collector in New York now! THAT ISN'T FAMILY!!! Violet has been with me for some time now and I was so excited to see that someone had bought her AND that it was a repeat customer. 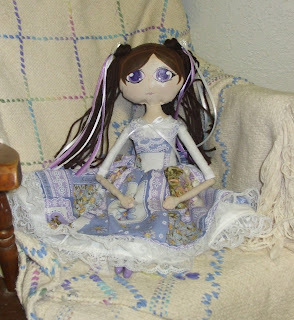 The second doll to find a home was a newer one. Claire has been in the works since about March when my mom found an very pretty Irish print fabric. So I was commissioned and Claire went to my grandma. 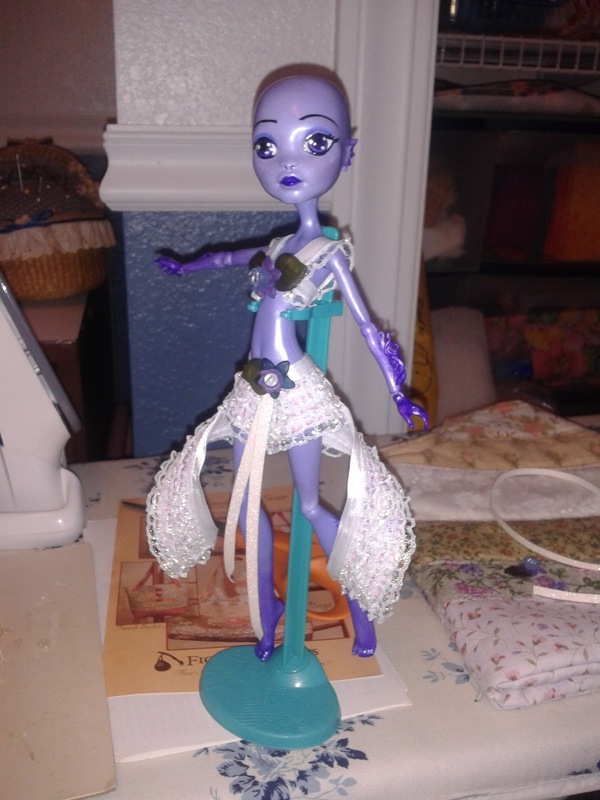 I was very proud of her, but while looking at pictures of both Violet and Claire, I can see just how much my style has changed since I started Little Nightengale Designs 3 years ago. Claire, you can barely see her freckles sadly. 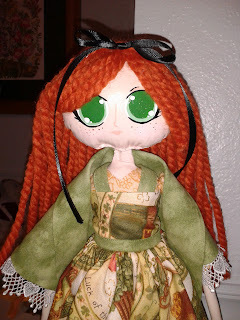 The same time I was working on Claire, I finished 2 other dolls to be posted to my shop. While I'm proud of both, one drove me nuts! Nothing seemed to go right with her! It fits though because she is my namesake. Nightengale was a character I created years ago. She is a bad as and apparently she is difficult as a child too. I was so happy when she was done! The second doll still really doesn't have a name, but I do LOVE how she turned out. She's so bright and cheery. the fabric was bought on a whim. ^_^ I love when it works like that! The recent trip to the beach resulted in more fat quarters for my stash, my dream fabric for a skirt, and the most awesomest seam ripper ever! Not even kidding! It fits my hand wonderfully, is hand made and has pink in it. I adore it so much. I bought my mom a similar one. I actually had to make a special trip back to the fabric store because when I first found it, I held off on buying it, but I am so happy I went back for it. There are new things in the works. If you follow me on bookface at all, you have caught a glimpse, but for those that don't, here's a sneak peak. More to come when she's finished. I'm currently waiting on hair.